Sometimes despite your best house-hunting efforts, you find yourself stuck in a rental property that leaves a lot be desired. 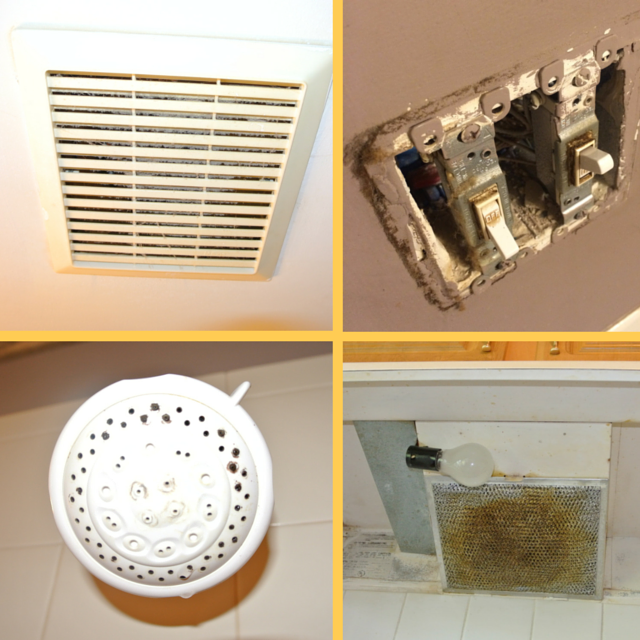 Perhaps your landlord’s standard of cleanliness is drastically different from your own. Or maybe the place is just outdated and needs a little facelift. As a renter, it’s hard to put too much time or money into a place that is temporary but it’s also important to make it feel like home. 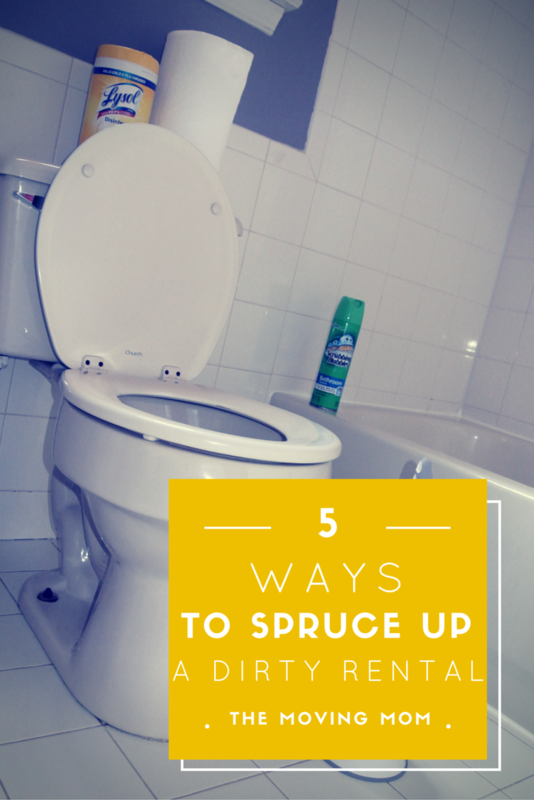 So we’ll share 5 quick, simple ways to make even the nastiest rental feel more inviting. And I know from experience because all the photos in this post are from a condo we rented for more than a year! I am no expert on home improvement but these are the techniques and products and tricks that I found to be most effective. Problem: Scuff marks, food and crayon littered our walls when we arrived. In the kitchen, we also came across grease splattered on the walls and wooden blinds. Solution: Mr. Clean Magic Eraser Pads were sent directly from God, as far as I can tell. They remove nearly EVERYTHING, including permanent marker. The drawback is that they leave a bit of a residue on walls and can even lift the finish off wood floors, so test a small area first and decide whether removing the mark is worth the possible residue. And when it comes to grease – nothing I’ve used works better than Goo Gone . It smells like citrus and cuts through the sticky, caked on food. Just be aware that it may leave the surface a little slick. 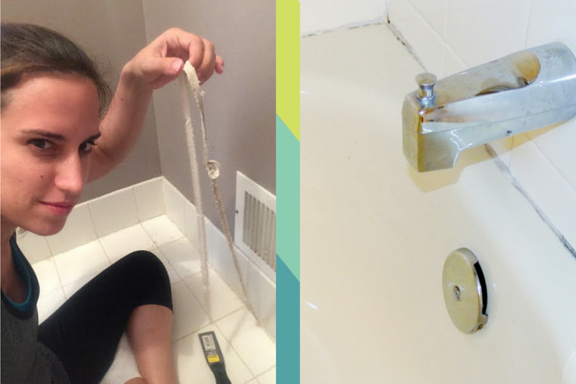 Problem: The caulking in my condo’s bathrooms and kitchen was among the biggest offenders in the whole place. It was moldy in the shower and yellow with grease stains in the kitchen. Solution: Buy a putty knife for less than $5 and get to work removing that disgusting old caulking. 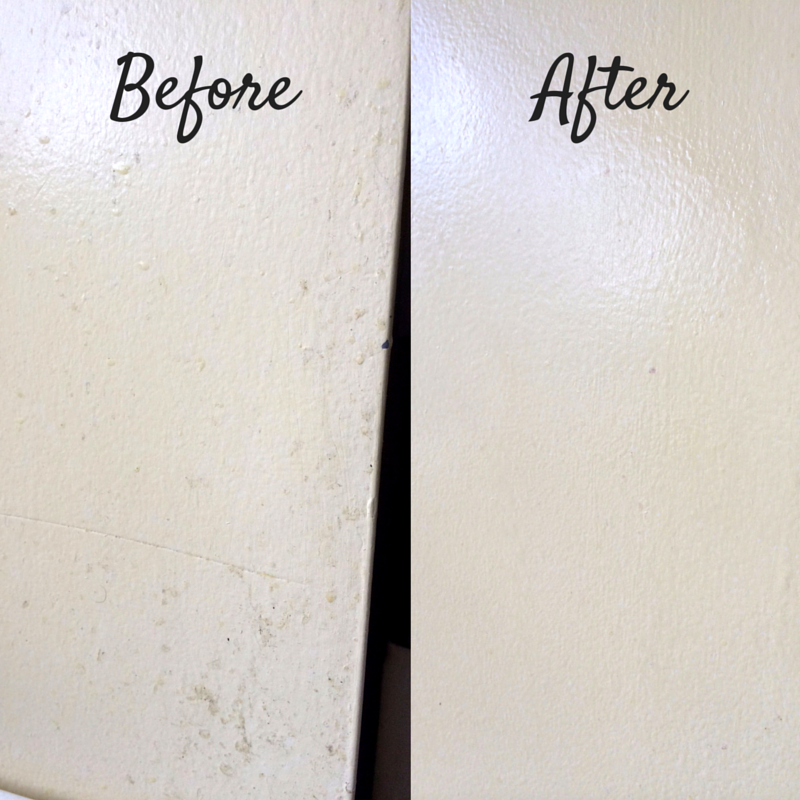 All it takes is a little scraping and it will come right up – especially if it’s old. I found myself strangely addicted to this satisfying task. Then invest in a caulking gun, an edging tool and some caulk in whatever shade you need. Practice installing the new sealant until you perfect the art and then have at it. This will seriously make a space instantly look newer and more hygienic! The whole project will cost you less than $30. Problem: The trim or shelves in your rental are stained, dingy or just plain worn out. Solution: Invest in a small can of paint, drink some wine and have a little painting party. 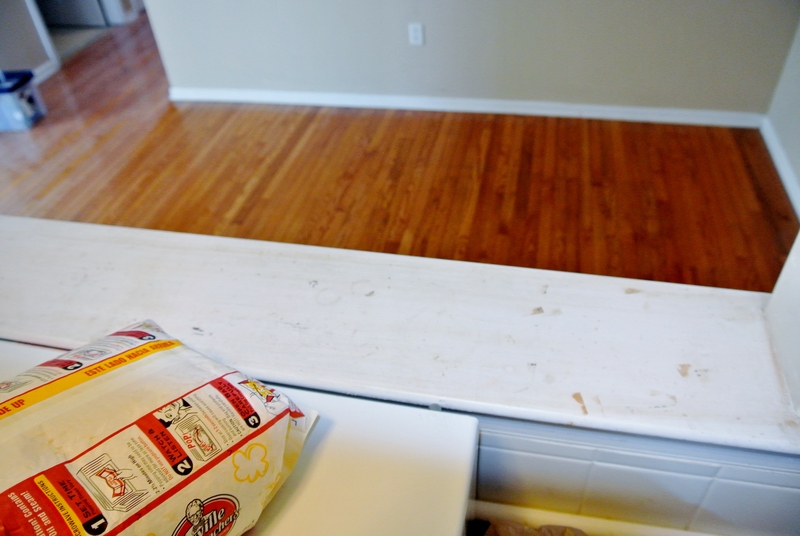 It won’t take long and a little paint can cover a long list of rental sins. 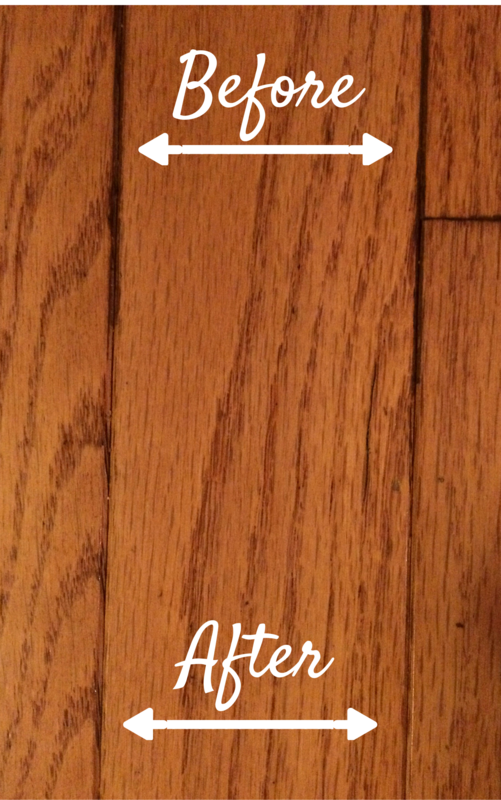 Problem: Your old wood floors look as though they’ve never been cleaned. Ever. Ours actually turned our feet black after about ten minutes each day. Solution: You may not like this one. It requires a lot of work. But it’s effective. All you need is a towel and a mixture of 1 gallon of water and 1/2 cup white vinegar. Lightly moisten a section of the floor with the solution and let it sit for about 10 minutes. Then start scrubbing meticulously between the pieces of wood until the ancient dirt particles give up and dislodge themselves from between the slats of wood in your flooring. Be sure to use a dry towel or sponge to soak up any excess liquid before you finish. 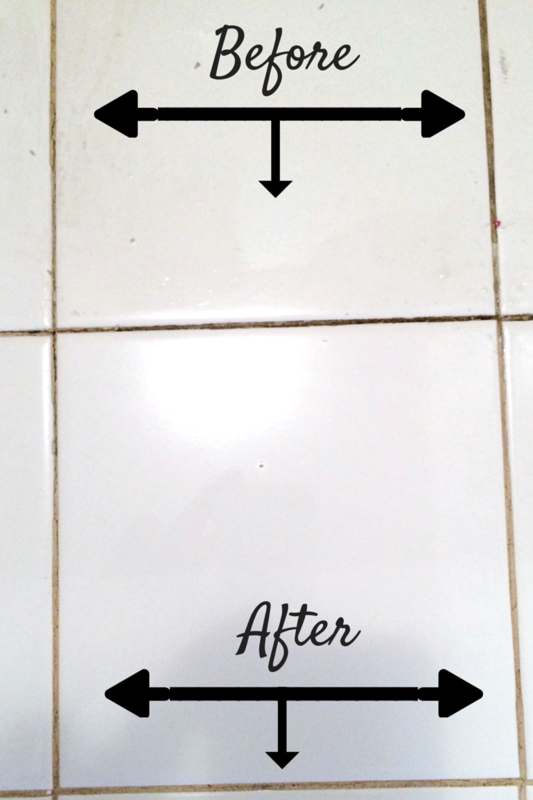 Problem: The grout in between your bathroom tiles is caked with grime. Solution: Wet the area you intend to clean. Next, make a paste of sorts by combining baking soda and water. Spread it on the dirty grout and let it stand for a few minutes. Then use a scrub brush or old toothbrush to attack the dirty grout. It may take a few applications of the paste to loosen and remove the debris. Change out the shower heads in the bathrooms. You can even keep the old one in a bag and put it back up before you move out – that way you get to keep your luxurious spa spout. Take off the vent covers and give them a good cleaning. Some can be done with a vacuum and others will require soaking and scrubbing. Remove light switch covers in an especially dirty apartment and use a rag and Q-tip to rid them of dirt. Check the hood vent above your stove top – if it looks like ours did, then it’s likely NOT doing a very good job anymore. You can try to clean it or get yourself a brand new one online or at your local home improvement store. Aw, this was an incredibly nice post. Spending some time and actual effort to make a great article… but what can I say… I hesitate a whole lot and never manage to get anything done.